After a battle between two apple crumbles, the Cream Cheese and Apple Crumble won in the weekly poll. I can’t tell you how much I love warm apple desserts. They’re by far my favorite kind of dessert and they’re always a crowd-pleaser. This particular crumb topping substitutes the butter for cream cheese. 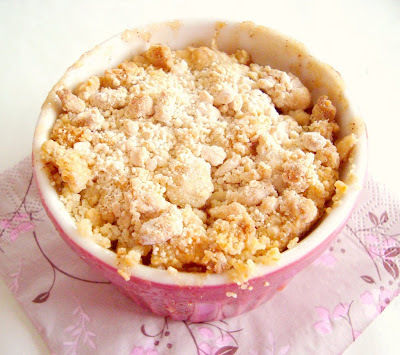 What you end up with is a crunchy and flavorful crumb topping that goes along beautifully with apples. 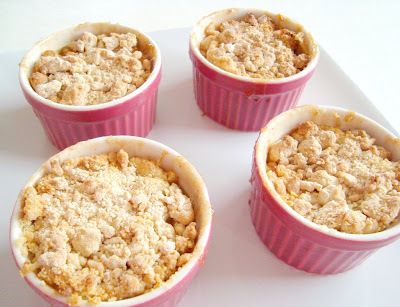 I was very pleased with the result and quickly devoured my apple crumble in the pretty pink ramekin. I made a little too much crumb topping so I peeled two more apples and made another Cream Cheese and Apple Crumble using a pie dish. The pie dish was gone quickly too! Rating: 5 out of 5. - Preheat the oven to 375°F. Mix cream cheese spread, cake flour and sugar with a fork or pastry blender (I found it to be the easiest to mix with my hands) until mixture resembles coarse crumbs. Set aside. - Melt the butter in saucepan. Stir in flour to form a paste. Add both sugars and water; bring to a boil. Take off heat and let it cool for a bit. Pour the liquid over the apples and stir to coat. Add the cinnamon, ginger, allspice and honey, and stir again. 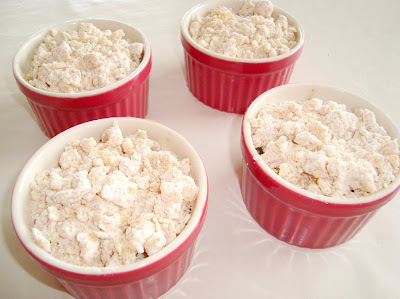 - Scoop and divide apple mixture between ramekins or pie dish and sprinkle the cornstarch over the apples. Top with crumb mixture and place in the oven. Bake for 25 minutes if using ramekins or 40 minutes if using pie dish, until the crumbs are light brown. Transfer ramekins or pie dish to a wire rack to cool completely. The little ramekins waiting to be put into the oven. The crumb topping is made entirely out of cream cheese - no butter. I like to serve my crumble with unwhipped cream. I think the contrast of the warm apple crumble and the cold, runny cream is so delicious! Really a worthwhile extra touch. Those pink ramekins are to die for! I want some!! Your ramekins are really beautiul!! But the crumble actually fits me better! Apples and cream cheese - this sounds divine! It's a lot less cakey.